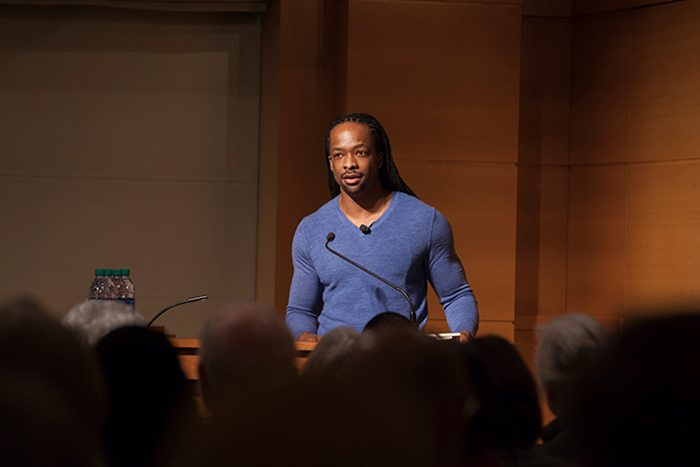 Jericho Brown, associate professor of creative writing, read first for "The Bard and Poetry" and explained why he considers himself "a love poet." 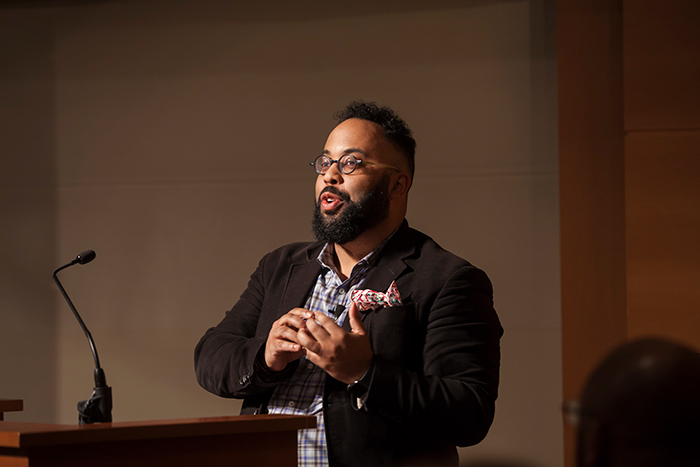 Kevin Young, who has served as Charles Howard Candler Professor of Creative Writing and English and curator of literary collections and the Raymond Danowski Poetry Library, read next from his collection "Blue Laws." 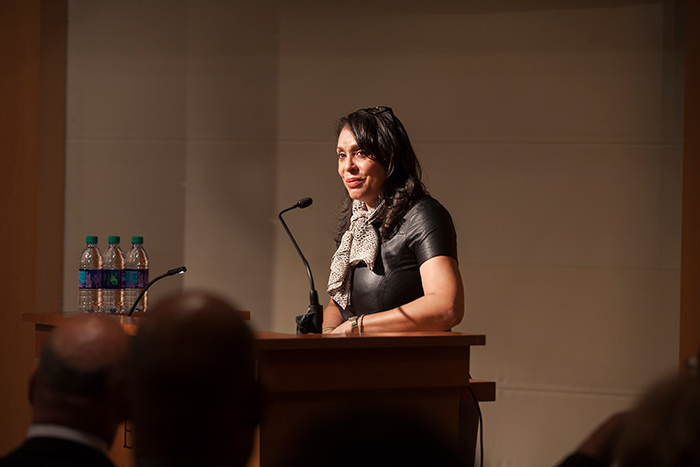 Natasha Trethewey, Robert W. Woodruff Professor of English and Creative Writing and director of Emory's creative writing program, concluded with a reading from her upcoming memoir "Memorial Drive." After their individual readings, Trethewey, Young and Brown discussed Shakespeare's ongoing literary influence. 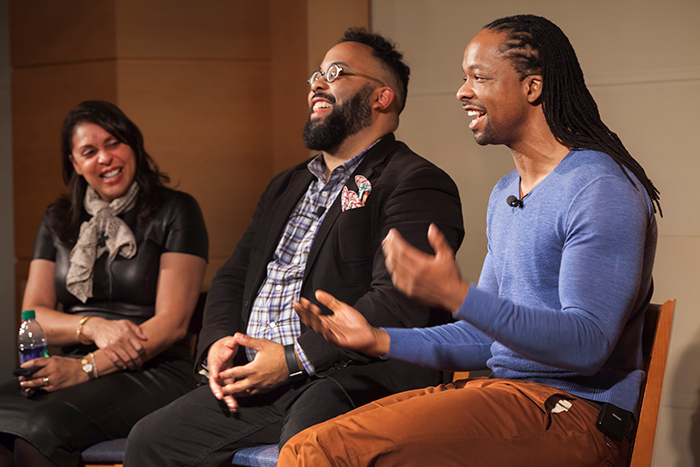 As Shakespeare's First Folio nears the end of its visit to Emory, the community gathered Dec. 5 for "The Bard and Poetry," an evening of readings from acclaimed poets Natasha Trethewey, Kevin Young and Jericho Brown. The three Emory professors read from their own works and Shakespeare's poetry for the final Shakespeare at Emory event while the First Folio is on campus. The exhibit, which opened Nov. 5, continues through Dec. 11 in the Michael C. Carlos Museum. Jericho Brown, associate professor of creative writing, read first and described how he considers himself "a love poet." "I ask myself where there is tenderness in the bleakest of moments," he explained. His first book, "Please," won the American Book Award and his second book, "The New Testament," won the Anisfield-Wolf Book Award. Kevin Young, who has served as Charles Howard Candler Professor of Creative Writing and English and curator of literary collections and the Raymond Danowski Poetry Library, read next from his collection "Blue Laws" and discussed how he tries to help students to understand the "inside" of a sonnet. He is the new director of the Schomburg Center for Research in Black Culture. Natasha Trethewey, Robert W. Woodruff Professor of English and Creative Writing and director of Emory's creative writing program, offered a moving reading from her upcoming memoir "Memorial Drive." She is a former U.S. poet laureate and won the Pulitzer Prize for poetry in 2007. Emory was the only Georgia site chosen for "First Folio! The Book that Gave Us Shakespeare," a national traveling exhibit from the Folger Shakespeare Library, which is coordinating displays in all 50 states to commemorate the 400th anniversary of the Bard's death.